Review of the USR Wireless MAXg router model 5461. 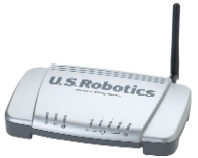 This 125Mbps wireless router from U.S. Robotics provides new levels of range and speed for wireless connections and supports the latest wifi security standards. The router is about the size and shape of a video cassette with four small molded feet, so it can only be stood horizontally. It sports a single small antenna on the back along with 4 ethernet LAN ports and 1 ethernet WAN port for connecting to an ethernet cable/adsl modem and usefully a single usb port for attaching a usb printer. The router has all of the standard features you'd expect : firewall, port mapping, dmz host, dhcp server and remote logging. To start configuring it you need to connect to it initially via ethernet first, so wireless security can be safely configured. Unlike most other home router manufacturers, the usr maxg router defaults to using IP addresses in the 192.168.2. * range, rather than the more usual 192.168.1. * - so if you already have IP addresses assigned to your PC you may need to reboot in order to get a new one that can connect to the wireless router. It's easy enough however to move the router to a more useful address that is in the same subnet as you are already using, though you need to remember to either turn off the dhcp server in the router (if you already have a device allocating addresses) or configure it to provide addresses in the same range. There are helpfully some simple troubleshooting tips in the printed install guide that should be enough to get you connected to the routers configuration page. The default settings are designed as usual to just get you working as quickly as possible, which means with minimal wireless security. The web configuration is very straight forward, with helpful comments explaining what the settings mean on each page. Helpfully the router supports generating a random password for the wireless security which ensures you are using a long enough password to prevent someone from guessing it with a dictionary or brute force attack. When changing settings it seems to take the router a few seconds to save them, so often you have to refresh the page as the router doesn't respond for a few seconds after clicking save. The single feature that impressed us most however with this wireless router was the range of its wireless signal. Even removing the antenna, and putting it 30 yards away through several brick walls, the signal still didn't drop a beat. In fact we were unable to put it anywhere we couldn't get a signal from it. This means that in normal home or small office environments, you will be unlikely to need repeaters dotted around to ensure you can get a signal everywhere as this one router should allow you to connect from anywhere. If you are after a wireless router for your cable/adsl modem, then you should give this MAXg router a look. Now that prices of this new generation of wireless kit (with higher speeds and better range) has come down, there is no need to settle for old 54g connections any more. The router was easy to set up, and importantly easy to secure and has all the features you could want from wireless kit, including WDS for connecting access-points and routers, and WPA (as well as WEP) for securing your connection.